Ahead of the first official Life Just Is edit session this weekend, I thought I'd write a small update on what Murat and I have been doing since the shoot. Although it was very tempting to jump straight into cutting the film, Murat and I both felt like it would be a mistake. As I'm learning more and more every day, making a feature is a complicated process, and it's important to prepare yourself accordingly if you want to try and get the best out of the project. Right after the shoot I took a much needed break (or at least, I tried to), both to recover and to try and get some distance from it – I wanted to put the experience of shooting the footage behind me and approach the material with fresh eyes (if such a thing is possible). Murat, however, got straight to work transcoding, syncing and organising the files. 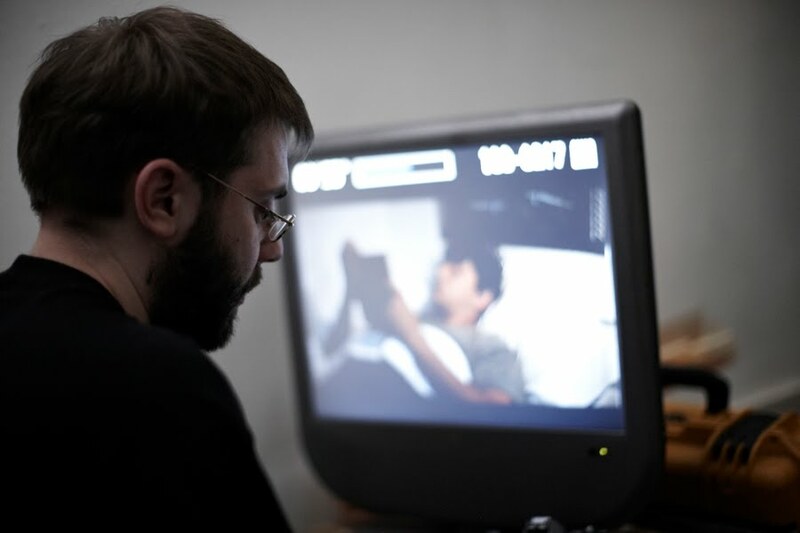 While Murat continued this process, I began to look through all the rushes. Before cutting anything Murat and I decided that we should know our material and get familiar with the rushes. So I started going through everything on a shot-by-shot, take-by-take basis, making notes (75 A4 pages of them in total!) on all aspects of the footage, working specifically under three separate headings: Performance, Visuals and Audio. Murat has used my notes, along with the comments from the logging sheets completed on set, to create a searchable database. That way, when we're three months into the edit and I suddenly remember that we have a take where Tom smiles a bit wider than he does in the take we're currently using, we'll be able to find it at the touch of a keyboard. We'll also know how many angles we have on each scene, what I thought of them all, and therefore what our options are if we want to change things around. Although creating all of this has been something of a lengthy process, it'll speed up the editing process no end and it's also provided me with the perfect opportunity to really get to know the material. While the focus on this period of postproduction has really been about familiarising myself with the rushes, I have also been making notes more specifically related to the edit. I've spoken before about my attempt with this film to reach something approaching a synthesis of form and content, and what this means practically is that we're trying to use the language of filmmaking in a way which goes beyond the illustrative. To this end, then, I've been noting down editing schemes for the scenes based on, for want of a better expression, the conceptual ideas that I had in mind when planning the coverage for each scene (now that the rushes are in front of us, it's important not to lose sight of these ideas, even if we ultimately discard them during the editing process). An example of such a 'concept' would be a scene featuring the characters of Tom and Pete. At the beginning of the scene they are arguing, approaching something from two different sides with no common ground. For this part of the scene the idea would be to keep them apart visually by using single shots featuring only one actor at a time. Then, when the emphasis of the scene shifts and becomes about their friendship and support for one another, we would begin to use shots featuring both actors within the frame. Whether these ideas will work practically remains to be seen, but they certainly point towards an editing pattern for the rough cut (which, incidentally, we are still hoping to have done by the beginning of the New Year). Despite the heavy workload all of this has been, I have been working on other exciting Life Just Is related things, as some of you may have seen. Firstly, we're running a competition to design our poster. Special mention has to go to Justine and Roland here for their hard work in helping make this happen. Personally, I'm really excited about it because we've always wanted to involve people in what we're doing and make them a part of our process. All the entries will be compiled into a free e-book that we'll give away for download on our site, and we'll also be running a public vote as part of the judging process, so I hope that you'll all get involved even if you don't want to enter the competition directly. The other big piece of news is that our hiatus is over, and Life's Just Networking will be returning to The Duchess on January 11th 2011. Can't wait to see you all there! Congratulations Alex on reaching the post production stage, sounds like your going to be very busy indeed. I like Murat's advice about making yourself familiar with the rushes, always a good idea (especially when considering pickups and additional sound/quality of dialogue. I also like your plan to split everything into Performance, Visual and Audio (always good to see a director taking notes on the audio too) This will undoubtedly help further down the line when completing the cut, taking out scenes that just don't work or trimming the length / re-working the order of the clips. Of course, a good editor will certainly make this process easier for you, continually offering up alternatives. It would be a good idea to start shaping up the audio whilst your cutting too, thinking about music cues, ALT dia takes (boom/radio) and wildtracks + SFX you may require. This may save time during sound post & will definitely be welcomed by the sound post house (if only to get you familiar with the audio you would like to hear in your film). It's always advisable to work in project reels (max. length standard 2100ft / 22mins reels) typically 5 reels per 90min film, thinking about the overlap process (to cut the reels at scene changes without music/continuous sounds would be best) Working in reels also improves work-flow and project management. We would certainly encourage this way of working. Did you shoot 24 or 25fps? You should be aware that sound for 35mm is at 24fps and may need to be pitched down 4% if shot at 25fps (when a film is shot at 25fps and played back at 24fps, the sound drops in pitch around 4%), depending on content (teenage kids, female's etc) could sound a little low and unnatural - just something to be aware of. As you will working with reels, exporting OMF sound project reels with TC and 5 second handles is what you should be aiming for 24-bit/48k standard. Dreambase Studios wishes you and your team all the very best on the post production of your film and do drop me a line if you have any sound related questions or would like us to help in any way.